Today we decided to analyze two e-Commerce giants – Bigcommerce vs Shopify – and review them for you while comparing what they have to offer. We will analyze and compare Shopify’s and Bigcommerce’s payment options, fees and pricing plans, free and premium templates galleries, apps stores, and their most important features. Check out our full review below and decide whether Shopify or Bigcommerce is the best option for you to use for your online store. Both Bigcommerce and Shopify are e-commerce platforms that give you all the tools you need to easily set up your online store in minutes and start selling your products online. You can use these platforms to sell both digital and physical goods. You can sell them anywhere in the world via your website. The concept behind these platforms is that they offer a complete package, for a monthly or yearly fee, and you don’t have to write a single line of code or hire a web designer. You will be able to fully manage your business and even create your online shop website in a matter of hours, using their intuitive interfaces and dashboards. Bigcommerce and Shopify are ‘software as a service’ (Saas) tools. There is no big investment at the beginning like it would be if you’d want to build your online store from scratch, but there is an ongoing cost and you can pay monthly or yearly. Shopify plans are by far a lot cheaper than Bigcommerce pricing plans, so this could be a good option for small online stores that are just launching their business online. However, you should carefully analyze the features offered in each plan. The Lite plan, which is the cheapest, doesn’t really offer that much and you may quickly outgrow it. 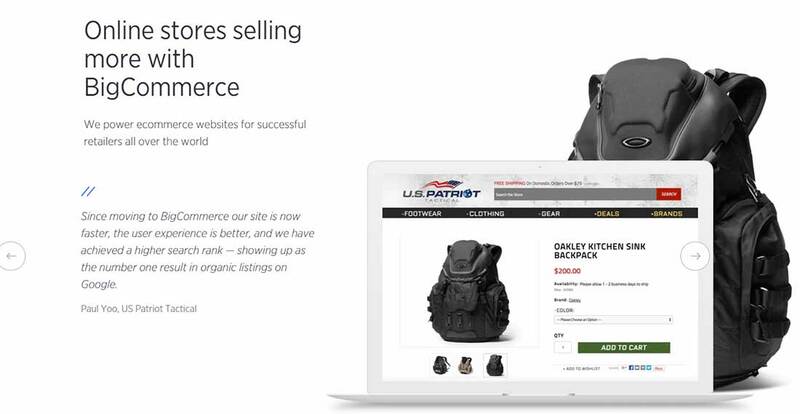 It simply offers you an embeddable Shopify button, like a widget, for selling products on your existing site. You can try Shopify free for 14 days with no credit card required. 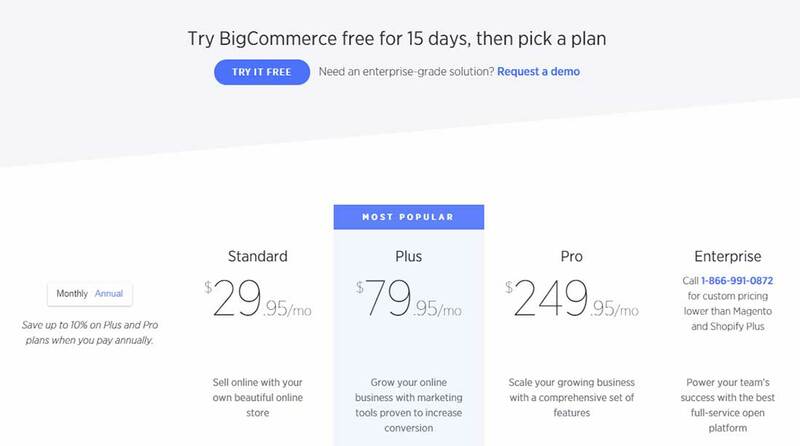 On the other hand, Bigcommerce offers 15 days trial – 1 day longer than what Shopify offers. Both platforms are excellent for you to try, so take advantage of both the Shopify 14 day free trial and the Bigcommerce 15 day free trial. Bigcommerce has a 0% transaction fee on all plans. However, Shopify has the same 0% fee on all plans too BUT only for the Shopify Payments system. Their own payment gateway is only available in certain countries at the moment: United States, Puerto Rico, Canada, United Kingdom, Ireland, Australia, New Zealand, Hong Kong, Singapore. The 0% charge is not available for external payment gateways. 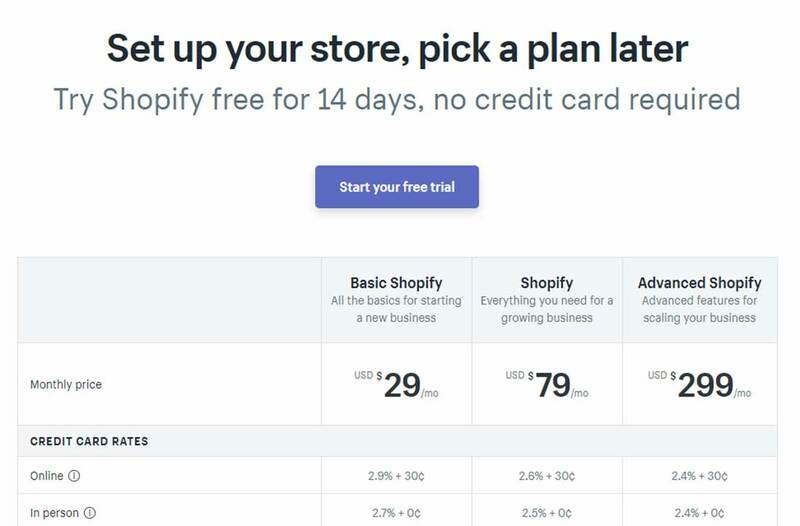 If you decide to use an external payment gateway, Shopify charges you depending on the plan you’re on – 2% for Basic Shopify; 1% for Shopify and 0.5% for ‘Advanced Shopify. These are the fees that Shopify and Bigcommerce may charge you for processing credit card payments. If you use an external payment gateway, these fees are different from provider to provider. Here are the US rates for the Shopify payment system. The good part about Bigcommerce compared to Shopify is the competitive rates that decrease as you grow. They give some special credit and debit card processing rates with PayPal to help you reduce costs, thus as you grow, your rates will get lower — down to 2.2% + $0.30 per transaction. Both Shopify and Bigcommerce offer a wide range of free and premium themes you can use to launch your online store. Shopify offers 10 free templates while Bigcommerce offers only 7. However, there are plenty of premium themes you can use for your site. Bigcommerce’s free themes are actually variations of just 2 main themes, so the differences between them are almost unnoticeable. 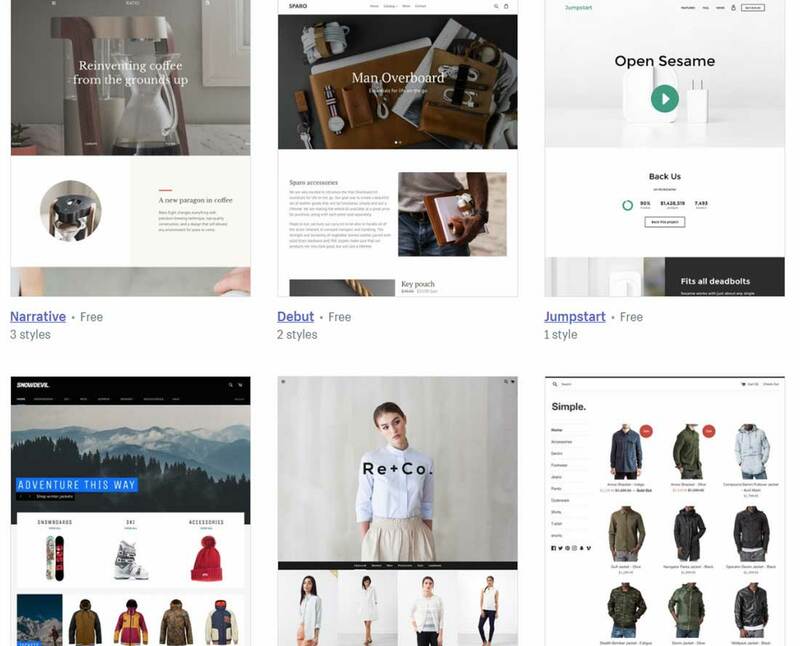 The 10 free themes offered by Shopify are very different from each other, so you actually have some options. 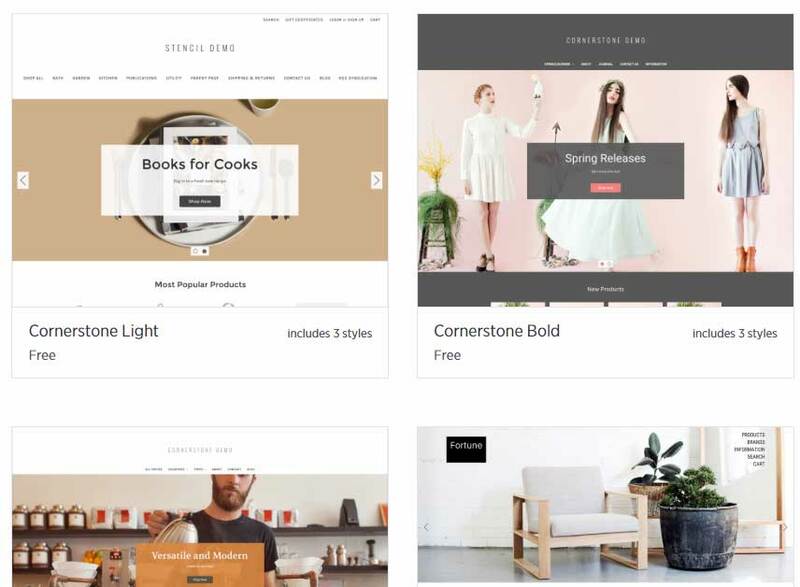 Bigcommerce gives you a templates library with over 100 themes to choose from. The prices range from $145 to $235. There are some discounts from time to time, so make sure you keep an eye on them. Shopify offers ~50 premium templates with prices ranging from $140 to $180. At a first glance, it may seem that you get more options with Bigcommerce than with Shopify, but this is not the case. The templates are quite similar to each other and if you analyze them carefully you’ll notice you get almost the same amount of unique templates as Shopify offers. Each Bigcommerce paid template comes with 3-4 variations. You can see that they share the same base name. 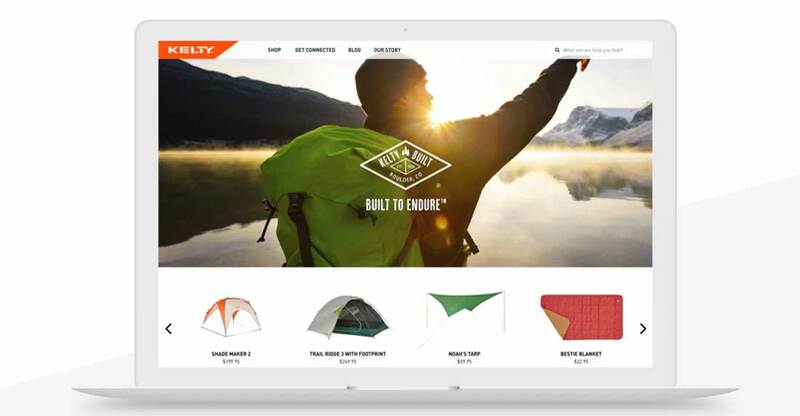 Both Bigcommerce and Shopify offer customizable themes that are optimized for conversion on both desktop and mobile. The themes are fully responsive, offer complex search filtering options, customizable product selectors, free theme upgrades and free customer support. Most of them are even powered by Google AMP, have customized checkouts, one-page checkout option, persistent cart options, and more. You can add product videos, mega navigations, multi-tiered sidebar menus and more. Both Bigcommerce and Shopify have easy to use customization options for their templates. If you want to do more in-depth customizations, HTML and CSS knowledge may be required. However, in most cases, this is not needed. All you have to do is choose a pre-existing template and change colors, fonts and the layouts by simply using the options provide and without any lines of code. 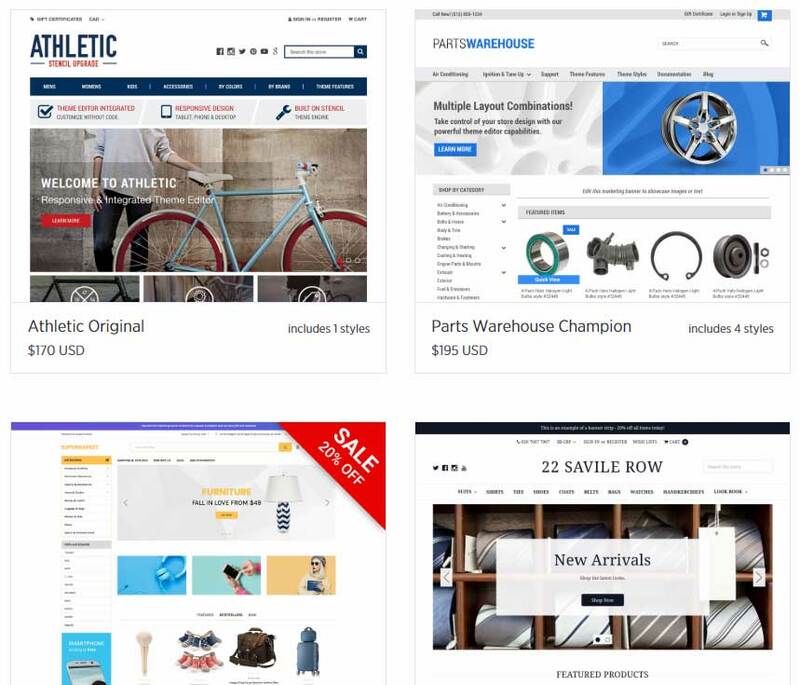 With Bigcommerce you will be able to personalize your site to engage and convert shoppers using a flexible modular code base, conditional logic and access to language files. The themes they offer are fully integrated with BigCommerce’s faceted search to help customers navigate your site. Shopify offers extensive options to fully customize your online store as well. You can manage everything from one place, from adding new sales channels in seconds to managing unlimited products and inventory, fulfilling orders in a single step and tracking sales and growth trends. Both Bigcommerce and Shopify give their clients/users a wide array of useful features to grow their online businesses. Shopify and Bigcommerce allow you to connect external payment gateways to your store. You may be limited by the country you live in, but you’ll definitely find a suitable option for you. PayPal and 2Checkout are the most popular payment options that are available in most countries. Bigcommerce also supports Braintree for processing credit card payments, while Shopify does not. You should check out which payment processor is the best for you and then choose the e-commerce platform based on this. You can also grow your mobile conversions with digital wallets. BigCommerce offers built-in integrations with digital wallets such as PayPal, Amazon Pay, and Apple Pay. You can easily add a digital wallet to your store. Having multiple categorization options for your products is essential, especially for larger stores. For example, if you sell makeup online you may need to add different eye shadow colors, lipstick types, and more. Setting up the product categories and option can be easily done in both Shopify and Bigcommerce e-commerce platforms. Personally, we prefer Shopify’s interface here because it lets you create categories which are automatically populated with the products based on the filters you apply. On the other side, Bigcommerce offers a more manual approach which can be cumbersome for large online shops. You can also use other products options, such as tags, prices, weight, and more. Bigcommerce lets you edit the products in bulk, but it doesn’t have such a smart categorization feature like Shopify. There is a downside too, even though Shopify seems to have a smarter approach. It gets its minus points when it comes to the limited options per product, letting you add just 3 options and if you want to use more, you’ll have to install some apps. Bigcommerce, when compared to Shopify, gives you more flexibility when it comes to product options and you aren’t limited. You can sell products of any sizes, shapes, colors, and more. Thus, when it comes to categorization, Shopify is the winner here, but in terms of product options, Bigcommerce is better. If you want to import a large number of products into your online store you can use a CSV file containing all your product data. Bigcommerce also supports XML, though CSV is the ideal file format. Shopify has plenty of store management options to ease your workflow. Customer profiles. You can use these to get to know your customers and deliver personalized offers to them. Customer groups. You can categorize and export customer lists based on location, purchase history, etc. Fulfillment centers. Connect Amazon, Rakuten Super Logistics, and Shipwire with ease. Order Fulfillment. You can fulfill multiple orders with just one click. Dropshipping. It is integrated with Ordoro, Inventory Source, and eCommHub. Refunds. You can easily refund the orders and the inventory is automatically updated. Mobility. Use the Shopify app to manage your store on the go. Email templates. You can send customized automated store emails. Bigcommerce gives you all the shipping options you need for improving conversion rates, such as real-time shipping quotes, advanced shipping platforms, outsourced fulfillment services, and more. BigCommerce is the only cloud-based e-commerce platform that is seamlessly integrated with ShipperHQ, the world’s most sophisticated shipping rate calculator. It also offers a fast shipping manager, the BigCommerce Shipping Manager letting you quickly set up all the locations to which you’ll be selling to and get real-time carrier quotes, flat-rate shipping, or weight- or value-based rates. Like Shopify, Bigcommerce also lets you outsource fulfillment with dropshipping. You can partner with a dropshipper that takes both product sourcing and order fulfillment off of your plate. It offers integration with providers like Doba and Ordoro. If you want to grow your organic traffic, content marketing is the way to go and a blog platform offers you the tools to do it. Fortunately, both Shopify and Bigcommerce offer a blogging tool that lets you drive traffic to your store. You are able to create a simple blog or even integrate a third-party platform, such as WordPress. Importing older posts is also easy to do in both of these platforms, Bigcommerce offering the Blog Sync option, while Shopify offering the Blogfeeder apps. There is one downside for Bigcommerce, as it doesn’t offer an RSS feed, which may be an inconvenience if you want to automatically send RSS newsletters. Both Bigcommerce and Shopify offer analytics tools so you can create customer reports, marketing reports, search data reports, finance reports, abandoned cart reports, and more. All these reports are accessible via the easy to use analytics dashboard. Shopify even lets you create custom reports for the Advanced and Plus plans, while Bigcommerce gives you access to an Insights tool, with more detailed content, for an additional fee of $49 to $249, depending on the plan you’re using. Even though the Insights tool is quite pricey, it is more detailed than the one offered for free by Shopify. Both sites offer Google Analytics integration so you can track sales, visits, and referrals. App stores are available for both Shopify and Bigcommerce platforms, but the app store offered by Shopify contains way more apps than the one offered by Bigcommerce. Shopify offers over 2000 apps, while Bigcommerce only 600+. What are apps useful for? Shipping apps: Bigcommerce offers integration with apps like ShipperHQ, Ordoro, Endicia, ShipStation and ShippingEasy. ERP integrations: Bigcommerce offers integration with enterprise resource planning suites like NetSuite, Brightpearl and Microsoft Dynamics. Accounting apps: Bigcommerce lets you sync order data with QuickBooks, Xero and Sage. CRM apps: Bigcommerce integrates with Salesforce, NetSuite and Zoho. Marketing & conversion apps: Connect with HubSpot, advertising and retargeting tools like Google AdWords, A/B testing tools, and more. Powerful API: So you can build custom integrations. We hope this comprehensive guide shed some light on the features that Bigcommerce and Shopify, the two popular e-commerce platforms, offer so you can make the right decision for your online store. Compare both Shopify and Bigcommerce carefully and see which one is the best for your online store.